View a preview of this week’s newspaper coupon inserts here. If you get a Sunday newspaper, you know that each week you can find coupon insert booklets like the ones in the picture above. We usually see anywhere between 1 and 3 most weeks, with some weeks bringing 4 or more. Occasionally companies such as General Mills or Kellogg’s will release special inserts as well. No one method of coupon organization works for everyone, but what I like to do is to clip only the coupons I am fairly certain I will use. I then file the rest of the (unclipped) coupon insert(s) in my coupon binder, just in case I decide to pull a coupon that I didn’t expect to use. 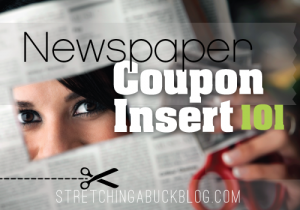 You always have the option of buying coupons online or subscribing to a larger newspaper if you would like to take advantage of the more robust coupon inserts. I also like to hit up my local Drug Mart to purchase extra copies of the newspaper for $0.99 when the inserts are especially good. Check around your local area for stores that sell the Sunday paper at a great price.Thankfully there is a growing number of printable coupon resources available online which help supplement the coupons that come in the Sunday newspaper, which is great for those who don’t subscribe, or who are looking for more coupons.